We’ve compiled a fabulous list of how to say thank you. So far, we’ve come up with 101 ways to say thank you that you can use any day of the year. If you can think of something that we haven’t listed here, leave a comment below and tell us and we’ll add it to the list and feature your contribution on the North Texas Kids Facebook page. 1. Send a Thank You Photo of you with your gift, enjoying your trip, party, etc. 2. Create a thank you video. Most of us with kids own some type of video camera these days. Make a thank you video, burn it on a DVD and drop it in the mail or post it to your YouTube Channel and email the link. 3. Write a letter. It is amazing how quickly something that was once commonplace can become creative. When was the last time you received a hand-written letter? Are you the crafty type? Send the letter on handmade stationery or a homemade card. 4. Phone call. With all of the more efficient and less committal forms of communication we have available to us – instant messaging, email, text messaging, etc, phone calls can almost seem like a hassle sometimes. That is exactly why calling someone to verbally thank them can be a very powerful way to express your gratitude. 5. Give a public “thank you.” Thank your recipient in front of a bunch of his/her peers. This will make them feel very appreciated as well as better their reputation among their peers. 6. Thank them with food. Find out what their favorite type of food is and attach a nice little note telling them why it is being given to them. 8. Make a banner or sign that says “Thank You” and place it in a place they will see it. If you live with this person, you could place the sign on the bathroom mirror or refrigerator door. If you work with the person you could place it near their office, the water fountain or elevator or wherever else they may see it. 9. A magazine subscription. This is a fun way to thank someone, that really can be pretty cheap. Some magazine subscriptions can go for as little as $5 a year. The recipient then has a monthly reminder of your generosity! 10. Help your child put together a small book titled, “Why You are Such a Great _______.” On each page of the book, your child can add their feelings and memories with illustrations or magazine cutouts. 11. Get an empty jar or can and a sheet of white paper. Cut paper into strips that will fit inside the jar, making the slips big enough for your child to write legibly. Have them write down special memories of the person and things they did. “It was great how you played dodge ball with us in gym every time you could” or “You really are nice when I feel sad.” On the outside of the jar or can, attach another piece of paper or a label that says: “Reasons why you are the best _______.” If you like or you have time, decorate the outside of the container with stickers or drawings. 12. For teachers: Make a trip to the dollar store and buy pencils, a box of tissue and a roll of paper towels. Get an empty paper trash bag and let your child decorate it whatever way he or she likes. Write “Thank you! Think of me next year.” Teachers ALWAYS can use these items! 13. If your uncle helped you shop for your first car, taking him out to dinner and giving him a booklet of car wash coupons would be in order. 14. If your father helped you plant your first garden, perhaps a new garden tool would be a nice way to say thank you. 15. If someone who has always been there for you just bought her first home, maybe you’d like to purchase lawn furniture or something equally useful as a token of your appreciation. 16. If someone was kind enough to act as your free DJ at an event you recently put on, repay that kindness by picking up concert tickets for a favorite performer for the DJ and a guest. 17. If someone was your right-hand man at a benefit you organized for the office, leave a gift basket filled with goodies on his desk the following morning. 18. While gift certificates for dinner and a movie might seem ho-hum and lame to some, those who enjoy movies and dining out will be very pleased with the gift, especially if you offer to babysit that evening as well. 19. Send Flowers, just because you can. 20. Send a favorite bottle of wine or spirits with a beautiful glass. 22. Present a small certificate. Half-page certificates take up less space if displayed and are as meaningful as full sized certificates. They tend to draw attention because they are different. 23. Give a single flower from your garden, flowerpot, or florist, with a verbal “Thank you” or a note. 24. Give a single piece of candy or fresh piece of fruit with a simple note. 25. Say something nice about the recipient of your thanks to someone else when the person you appreciate can overhear you. This is especially powerful in a business setting. 27. Greeting card. When was the last time you spent an hour in the greeting card aisle giggling over all the silly cards. It will cheer you up and make your friend’s day. Stock up on extra thank you cards while you are there. 28. Give your volunteers, helpers or individual a “Round of Applause.” Cut a piece of paper into a circle with a photo of people cheering that lists to, from, why, and the date. To say thanks to anyone give them a “round.” After a person collects three of them, they turn them in for a prize. 29. Offer a babysitter certificate or free child care. 30. Make a thank you board to display somewhere publicly that your team (or family) can all see it. As each person makes a contribution give them an “Atta-Boy” or “Atta-Girl” via the board. 36. Send an e-mail pointing out what you appreciate about them specifically. 37. Have an ice cream social for a group of friends or helpers. 40. Have a picnic in the park. 41. Surprise your group/friend with coffee and cake. 43.Take him or her to the movies – or give them gift certificates with popcorn. 49. Send an “at-home tea party.” Send a tea bag in a card and ask them to enjoy a cup of tea in the quiet of their own home. Make it more elaborate with a beautiful cup and box of cookies. 50. Treat them to lunch or dinner. Your time is often more precious than any gift. 52. Send a thank-you note to the volunteer’s spouse to thank him/her for sharing his/her spouse’s time and talents with the organization. 53. Send volunteers an “Encouragemint”. Great for your PTA members. 54. Plant a tree or flower bed in a volunteer’s name. 55. Contribute to a charity in a volunteer’s name. 58. Send a ball. Yes, really, an inflated ball with a cute message. Check out https://secure.sendaball.com/. 59. Simply listening — not talking — can be a rare gift. When your friend needs you, tell them thank you by giving them the gift of a shoulder to cry on. 60. Give someone a bear hug — put all your joy and appreciation into that hug. 61. Say thank you to the world at large. Pass along the gift of giving by doing a good deed for another. 62. Give of your time, offer to babysit, do chores, run errands, etc. 63. Music can express thanks in more ways than words. Create a musical compilation to say thank you, burn it on a CD and send it with a note. One of my friends saw I was training to run a half marathon and made me a CD of new running music. 64. Write an Acrostic Poem using the person’s name. My daughter wrote one using Minette one time and I am happy to tell you that “Toys can’t beat mom!” This is a fun project for kids. 65. One year we went to Build-a-Bear and made a special bear for Grandma with the kids’ voices. 66. Record a greeting card with your own special message. 67. Anything homemade is great, especially for kids! We have found that grandparents, aunts and uncles love artwork for the fridge as a thank you. 69. A gift card for cup of coffee at their favorite java stop. 70. Or better yet, invite them over for a cup of coffee with you. 71. A CD of music by their favorite artist. 72. For the younger crowd, we have found that an iTunes gift card rocks! 74. A book that you enjoyed or impacted you in a good way. 75. Tickets to sporting events, concerts, museums, what’s their favorite? 76. Just for kids: have a family game night, they get to choose the game. 77. A limo ride to the airport for their next business or family trip or to see Holiday lights. 78. A massage or other spa treatment at her favorite salon. 79. A manicure or pedicure. 81. Can of favorite soda or bottle of water: We can’t keep it “bottled up”…We just have to say thanks! 82. Lotion: Here’s a bottle of lotion for all the kindness you set in motion! 83. A pretty glass jar full of M&Ms with note: We think you are “Mighty and Marvelous”! Thanks! 84. A jar of nuts: We’re “nuts” about the job you’re doing… thanks! 86. Homemade soup or a nice soup mix: You are a “Souper” teacher! 87. Pasta – (Or any Pasta and a bottle of sauce, not only a nice gift but a quick dinner, too.) You are ‘Pasta’-tively wonderful! 88. For the neighborhood kid who watched your cat while you went away, cash is okay along with a nice thank you note. 94. Send an electronic thank you card. 96. A cute card with a list of what you are thankful for. This is great to take to Thanksgiving dinner and have people fill them out, then collect with a binder ring or clip and give to your hostess. 98. If you bake something yummy, put it in a dish they can reuse. Make sure to include the recipe with your thank you note. This gift keeps on giving. 99. If your friend is a crafty-type, give them a fun class at a local shop, online or a gift card to Michael’s or Hobby Lobby. 101. 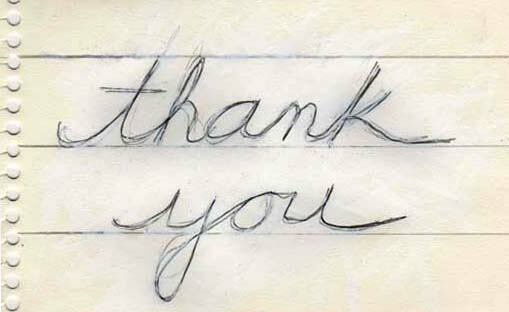 The Simplest Thanks! A basic verbal “thank you” goes a long way to promoting goodwill in general, whether it’s offered to someone who holds a door open for you or to a co-worker who helps speed along a project on your behalf.